In the early 1900s, guitar began to replace the banjo in American popular music orchestras. So demand for louder guitars led to continued experimentation. In 1922, Gibson's L-5 archtop guitar set a new standard for sheer size, being seventeen inches wide at its widest part. However, when Gibson decided to make a "Jumbo" model to rival Martin's "dreadnought" line, they chose a profile closer to Martin's, introducing the J-35. "J" stands for "Jumbo." The J-35 was the immediate ancestor of the ever-popular J-45 which Gibson still calls a Jumbo, but everyone else (including us) classifies with dreadnoughts. 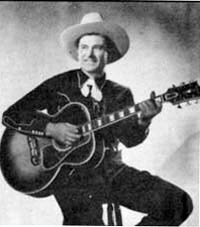 About 1936, Ray Whitley, the early Hollywood "Singing Cowboy" who wrote "Back in the Saddle Again," asked Gibson to build him a really loud flat-top. Gibson went back to the enormous profile of the L-5. According to some sources, Whitley himself proposed the original design. The Super Jumbo (later called SJ-200) was the result. The SJ-200's profile looks a little like a parlor guitar on steroids. Gibson added a unique bridge shape sometimes called the "mustache." They eventually went to maple back and sides, which some people believe produces a brighter tone. If you ever want to try a guitar that makes you feel like you could perform the "Hallelujah Chorus" or Beethoven's Ninth all by yourself, get your hands on a real SJ-200. It's no wonder they were favored by many rock, folk, pop, and country legends over the years. 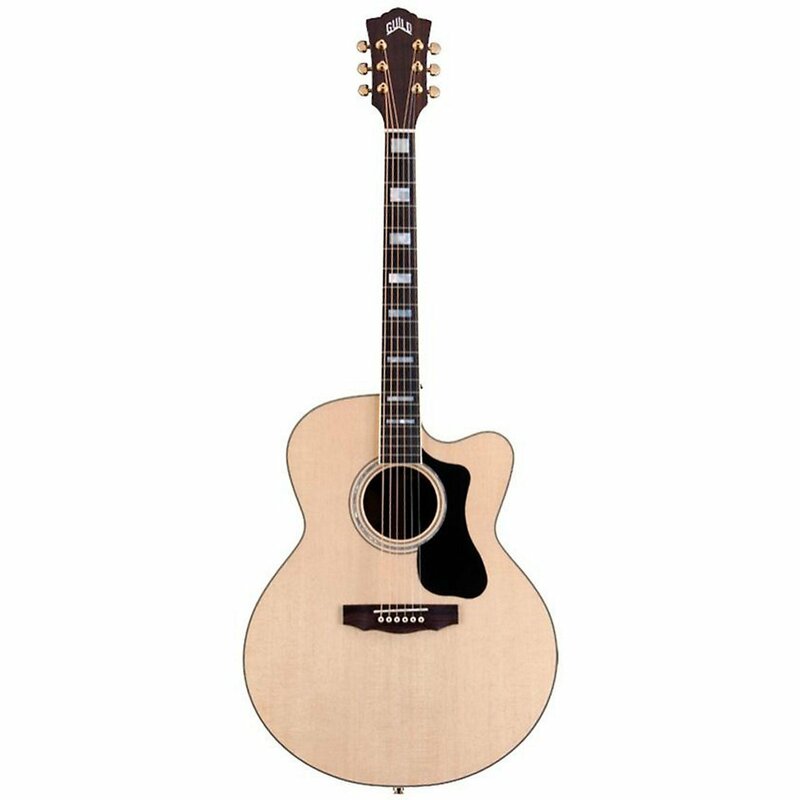 That said, the SJ-200's kid brother, the dreadnought-like J-45 became more popular over the years, especially as dreadnoughts became the "new standard" for acoustic guitars. Since student guitars are all about imitating what the "rich and famous" play - plus holding down expenses - very few "student model" "Super Jumbo" clones have been made in the last fifty years. So you're not likely to start on one. In fact, you'll have difficulty finding one worth playing. Note: In most of our buyers' guides we devote some space on the advantages and disadvantages of using each kind of guitar as a starter guitar. We're leaving that out of this section, since Super Jumbo guitars are not great starter guitars unless the student is big. They are made to be loud, not student-friendly. That said, if your arms are long enough and your uncle leaves you his Super Jumbo guitar in his will, don't "diss" it. For one thing, if it's a classic Gibson Super Jumbo, it might be worth more than your car. If you have the luck to inherit Gene Autry's custom model, it may be worth more than your house. The good news is that you can still buy professional solid-topped jumbo guitars that are made in America, providing you have a good source of income. The other good news - for folks without a "pro" budget - is that a few relatively decent Asian jumbos are available for a reasonable price. As with all imports, if you wind up buying online, you must have someone who knows what they are doing check it out and set it up while it is still in the return period. That there really is something wrong with it, but by the time they figured that out, it was too late to return it. On the other hand ninety-five per cent of the 5-star reviews are from people who know nothing about the instrument and just know it's pretty. The reviews you need to look for are 4-star reviews from experienced players who have ordered an import just to have one to take to parties or whatever, and realize it's nearly as much fun to play as their pro instrument. Again, the first one you get may fall short of your expectations, but the next one you get may far exceed them. That's the "upside" - such as it is - of poor quality control. By the way, I'm writing this page in March, 2015, based on experiences in the last five years. At this vert moment, several new companies with American-sounding names have introduced Chinese-made Super Jumbo copies that have not, really, been on the market long enough for anyone to get a good feel for their average quality. One company has introduced six models and EACH of them has one 5-star review on Amazon. What are the chances of these NOT being placed by a company rep or distributor? So if you click on any of the guitar examples I list below, you may see a dozen or more similar guitars that I "left out." Maybe by the time you're shopping enough other folks will have taken the plunge to give you a better sense of their quality or lack thereof. Lead guitarists used to playing way up the neck sometimes get frustrated when they get up to the fifteenth fret on a guitar neck and can't go any higher. So manufacturers have invented the cutaway option to give those players better access to the higher frets. It does affect the tone a little when the guitar is not plugged in (most people can't hear the difference, to be honest). But most manufacturers only put cutaways on guitars that they are also putting pickups on, and as I said earlier, the difference in the sound going down the cord to the amp is almost identical. In other words, having a cutaway won't really hurt your guitar, but unless you're already used to playing on the fifteenth fret or so, or all your friends think it's cool, it's not worth spending extra cash on either. As more companies get into the act of building these, you may come across a solid mahogany top, which is quieter, but more resistant to humidity changes. You may also come across a cedar top, which is louder, but softer and easier to damage than a spruce top. You will come across laminated tops of all kinds. Ironically, some of the laminated-top jumbos we made fun of in the 1960s have developed a pretty cool tone. But if I was ordering a new jumbo, I'd try to hold out for a solid top. I don't have another fifty years to wait for the tone to develop. The original SJ-200 was seventeen inches across the widest part of the body (the "bout"). Today "jumbo" guitar manufacturers copy the shape of the SJ-200 but not necessarily the dimensions. Alvarez has a 16" bout. Washburn and Gretsch seem to be a tad smaller. This is one case in which "bigger is better," so pay attention as you to such measurements as you choose. Not all "jumbos" or even so-called "super jumbos" are created even. To give you some idea of what you could get in various price ranges, here are some jumbo guitars that may be worth checking out. We confess to showing three top-line guitars. Usually we only show one or two in these charts, because we really think you should try out $3000-$5000 guitars before you buy them if at all possible. But they're so pretty. Plus individual models come and go, so getting a chance to see three of the current models side-by-side isn't as common as you might think. Have a pro check it out and set it up for you as soon as you get it. And be certain to get a case for it. Sorry - Super-Jumbo-style guitars do not fit in standard cases. No gig bags, either. And you may need a bigger car. If you follow any of the links below, you'll see a dozen more I didn't profile, but hopefully I've given you enough information to make an informed decision. Whatever instrument you choose and however you get it into your household, we wish you the best and hope it brings countless hours of enjoyment. Please check back for updates, and contact us with any questions, corrections, additions, or "reader responses." Note about Buying Musical Instruments New: Before you spend $2000 on an instrument that will be worth $800 once you get it home, check out the used market for that sort of instrument in your area. Depending on where you live, or what kind of instrument you're looking for, it may not be an option. But if you can get a used professional instrument for the same price as a new student instrument, it is often worth taking the risk. Especially if you have a knowledgeable friend who can go along and check it out for you. In fact, many of our pages include links to articles on how to shop for used instruments of various types. However, we recognize that many folks have limited access to good used instruments, and everyone needs to see what is available in the various price ranges. So we do list, when possible, live links to real vendors with a good return policy, in case they're your best choice for getting what you want. Again, once you buy something, your satisfaction is between you and the vendor. Note about Availability and Pricing: Although I try to keep an eye on things and to recommend products that are reasonably available, the model train market does fluctuate, and any product on this page may change price or become unavailable without prior notice. If you "click through" to see details on a product, and nothing happens at all, or you are routed to a supplier's home page, please let me know and I will remove the product from the online catalog until I can find a replacement or another supplier. For more detailed information about why products seem to come and go and why I have stopped listing prices for most products, please see my article "About Pricing and Availability." All material, illustrations, and content of this web site is copyrighted ? 2014, 2015 by Paul D. Race. All rights reserved.